When we were youths we four brothers, Robert (Bob), Ronald (Ron), Delbert (Dell), and Leo (myself) found our entertainment in ways strange to today’s younger generation. Before there was TV, and (believe it or not) even listening to the radio was only for special occasions as we had no electricity, and radio batteries were expensive and (during World War II) sometimes difficult to obtain at best, we did the best we could. In winter we waited for the weather to cooperate with our desires. After a thawing spell, followed by a general freezing, there might magically appear giant skating rinks awaiting our escapades. When the first of winter appeared it was off to the attic to find every pair of hand-me-down skates available. Each of us would pick a pair that more closely fit our feet size than any others. Then it was a task to remove the best set of laces we could find among the unused skates and reinstall them in the pair we had selected. After skates selection and preparation we each selected our warmest pair of woolen socks, often with a bit of air conditioning, but yet serviceable. Then it was time to bundle up in whatever old coats, scarves, ski pants, and such as we could find at the moment. Out to the ice pond we headed. Oh what a joy if the Matthews girls from next door also decided to spend an afternoon or evening in the same pursuit of entertainment as we boys. Betty, Gail, Sarita, and Anne were almost the same ages as we four boys. We had no specific games in mind such as hockey, or anything else. We knew nothing of such things. We merely skated all over the ponds, some times possibly playing tag or some other simple game. Simpler times, simpler games, rosy cheeked children, laughter, and we all survived those times of no entertainment that children know today. 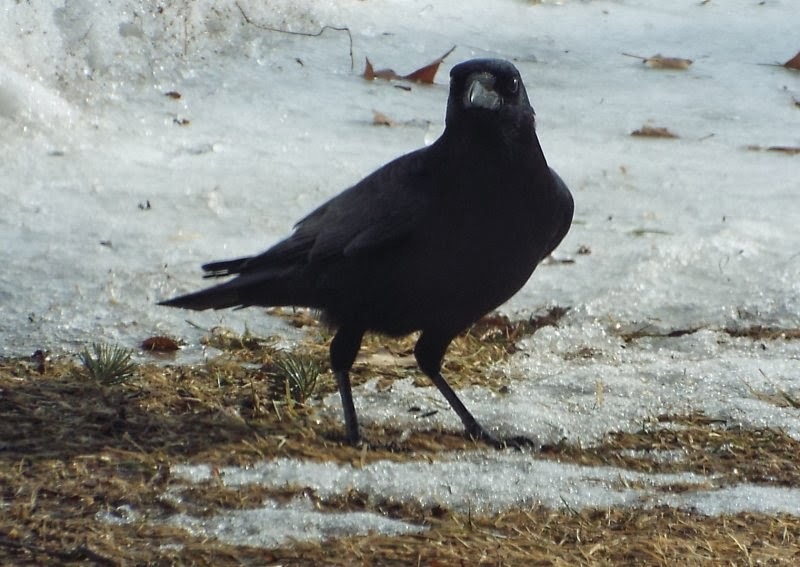 The American Crow is an all black bird, including the bill, legs, and feet, stretching to the 18” tall range. Its range covers all Canada, the United States east of the Mississippi, and the entire west with the exception of the most arid areas of the south west. When in flight its wings are nearly in constant motion, as opposed to hawks which glide for extended periods. 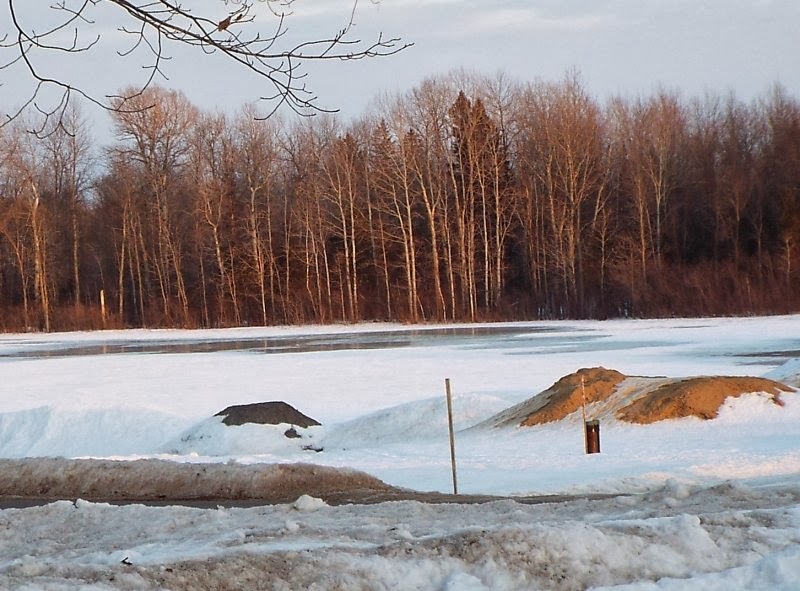 This photo was taken February 23, 2014 in northern New York, near the Canadian border. and spent some time on the Oriskany. also it was in DaNang. it’s seen more strife than this whole town. but it went with me and that’s what mattered. you don’t know a patriot when you see one. it ain’t going to be moved, and don’t you try. or it’ll see one more battle like it’s seen before. I like to photograph birds even though I have no particular love for them. 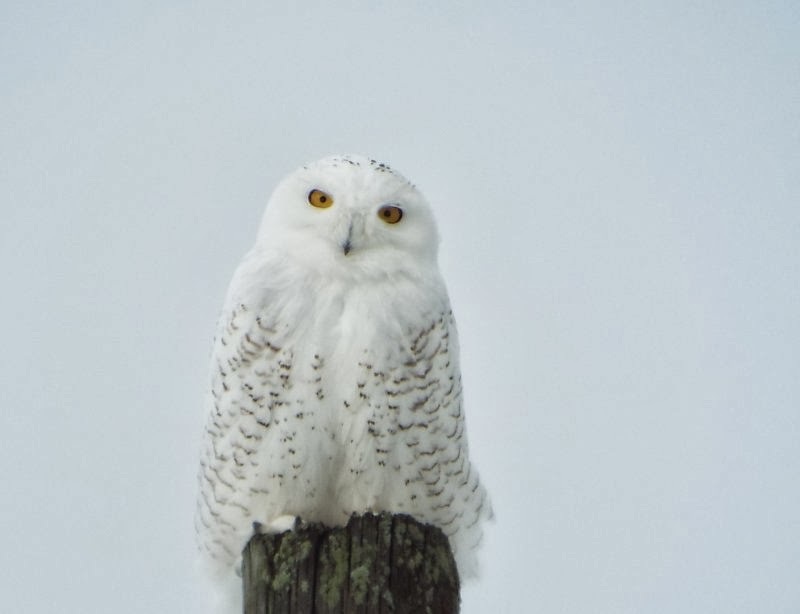 Today I was fortunate enough to spot this Snowy Owl. I was driving down a country road in the Heuvelton, St. Lawrence County, New York area when I saw this quite large white bird flying diagonally away from my vehicle. Guessing what it might be, I turned the next corner in its direction and was able to maintain eye contact on it.﻿ About a mile from my first sight of it the large bird perched atop a telephone pole. I was able to creep up on it with my Jeep. I began taking photos as soon as I could get within range at all to insure I got at least something, but I needn't have worried as it remained on the pole until I was within a few feet of directly under it. Judging that the pole might be 8" in diameter at the top then the owl appears to be possibly double that, or 16" tall. As they can grow to 28" in height that seems to be reasonable. They can live to at least 17 years of age, and quite probably more. An adult will have a wingspan of 4' to 5', and I guessed this one to be around that 4' mark. They spend summer far above the Arctic Circle only migrating into New York during winter in North America. I feel extremely fortunate to have had the opportunity of photographing this magnificient specimen. Randall Calhoun was a hound man. In that part of Mississippi, near Marion, that was a good thing to say about a man. Most times a man was known by whether he kept dogs, what kind of dogs he kept, and how he kept them. That was about all you needed to know about a man to know if he was worth anything or not. Doc, as all his friends knew him, was a veterinarian. To his credit, he would treat any animal smaller than an elephant, but his first love was those hounds he kept. He had Treeing Walkers, Plotts, Blueticks, and crosses between them, but not just helter-skelter, these crosses were well planned in advance. A dog man don’t just let things happen. Especially so for the Doc. He used his dogs to track and tree bobcats. Once he had them up a tree with the hounds bellering at the bottom, Doc would come along and climb the tree with that cat in it. He had this thing he made himself to catch them cats alive. It was nothing but a piece of plastic pipe about four feet long with a loop of cable run through it. One end of the cable had a handle threaded over it. He’d climb up to that cat and slip the noose end of that thing over its head and pull the handle. When he did he had a bobcat by the neck. He’d climb down from the tree dragging that cat after him. The dogs would worry the cat a little while Doc was getting it into a carrier. Then he’d sell the cat to a zoo. It cost far more to feed and care for those hounds than he got for the cats he caught, but that wasn’t a problem. To a dog man, cost was not an object. The fun was in the chase not the ending, or worrying about cost. Doc often turned them hounds of his loose where he found a cat’s tracks crossing a dirt road. He always followed them hounds on foot, until he caught a cat, or had to give up cause the hounds was wore out. Doc never wore out. I took one of my beagles to his clinic one day that had gone and got snake bit, and was in a pretty bad way. He laid her down on a table as gentle as a baby lamb, gave her a shot of something, and we sat around talking for a few minutes, I guess, to see what was going to happen next. Doc was standing there next to her table and sort of stroking the soft fur on the back of her neck. “You’re going to be all right, little lady,” he was crooning in that drawl of his. “Doc, I don’t know how to thank you sometimes,” I said. He said, “I’ll tell you what you can do,” as he slowly nodded his head. “Anything you say Doc, just ask and it’s yours.” At this moment I was vulnerable. Damn, the man had just saved my Becky Sue. I had gone rabbit hunting this morning just at daybreak. Mississippi might be in the deep south, but don’t you believe it can’t get cool on October mornings. I had five of the beagles running and had managed two cotton tails and one cane cutter already when I heard a dog snuffling in a brush pile not too far from me. It was just a minute or so later, I heard this sharp little yelp and Becky Sue came running over to me like she was asking me to make it better. I looked and seen this faint trickle of blood on her off foreleg. I suspected I knew what happened so I walked over to where that yelp came from. Sure enough, there was a big old rattler laying up along side a windfall pine. The sun had got high enough now to warm him up and get him moving for the day. I raised my 20 gauge and sent him to meet his maker or at least parts of him. A load of number six high brass will do a job on a diamondback. So here I was ready to give the Doc anything I had as long as he could save Becky Sue. It had taken me a while to round up the rest of the dogs, get them home and in their pen, and then drive to the clinic so she was panting pretty good when I got her there. “Doc, just what is it you want from me? America achieved greatness on the back of ingenuity. Inventions of all types stoked a newborn country’s labor force bringing about an industrial revolution like the world had never seen. As machinery was brought forth to replace manual labor, production levels soared. Our nation, which had been nearly totally absorbed in agricultural processes, changed. As machinery removed the drudgery from farming, and less farmers farmed more land, the newly found ex-farmers formed a labor force for the manufacturing revolution. Our farmers became factory workers. With the change to manufacturing our country found greatness on a world-wide basis, and rapidly became an industrial giant leading to a world power as great, or greater, than the world had ever known. Yet today our politicians have been prone to establish policies in direct opposition to this former greatness. Do they realize that there are millions of aliens working in our country, and sending most of their wages back to their homeland while the misguided fools of a do-nothing congress talk continuously of allowing them to remain in our country. Our future social security system is being exported to Mexico, Guatemala, and dozens of other countries in this manner. Does the average American citizen realize that every time they buy a Chinese manufactured product that they are in fact subsidizing Chinese labor instead of supporting their own country? Wake up America! Our future is being outsourced! On my previous post, March of Dimes, I mentioned an old poem that I had heard as a child. I was never able to find a copy of it. Now due to asking for a copy, my grandson Chris Dandro, located this copy in an obscure book. It is my opinion this is an adaptation of the original poem by Dr. Henry Drummond of nearly the same title, by a gentleman named Daniel T. Trombley. got scare an’ run below. by’me-by she blow some more. ‘bout half mile from de shore. he walk on de hine deck too. he also call de crew. on dat big Lachine canal. And de Sout win’ she blow too. an’ he lash her to de mass. so long you stay on de shore. President Franklin D. Roosevelt formed the March of Dimes in January 1938 (the same year I was born) as a foil against Infantile Paralysis, or Polio, a condition for which he had been diagnosed. Cards with slots for dimes were passed out in schools. We children would go door to door almost ready to buy, beg, borrow, or steal enough dimes to fill our cards for a rapid return to our teacher. Apparently, in time those dimes helped as a vaccine was developed to combat the disease, and a complete cure was ultimately found. Meanwhile there was another performer, perhaps a Mr. Jolly Bergeron, who year after year offered an oral presentation of a poem about Lake Champlain. It was spoken in a broken French dialect, and ever a huge hit with the entertainment starved audience. The words, “The vind she blows one hurricane, and the vind she blows some more,” are forever, right or wrong, stuck in my head. Some fifty years later, in 2004, I made an attempt to locate the words of the poem. I’ve forgotten the name of a gentleman from eastern New York who, upon my requesting it, offered a poem titled “The Wreck of the Julie Plante,” by Dr. Henry Drummond as essentially being what I recalled from so far in the past. Somehow though, it never seemed quite right. I recalled the poem as relating to Lake Champlain, not some place I’d never heard of, somewhere in French-speaking Quebec, Canada. If, by chance, anyone should read this that has a copy available, I would very much like to have a copy of it.